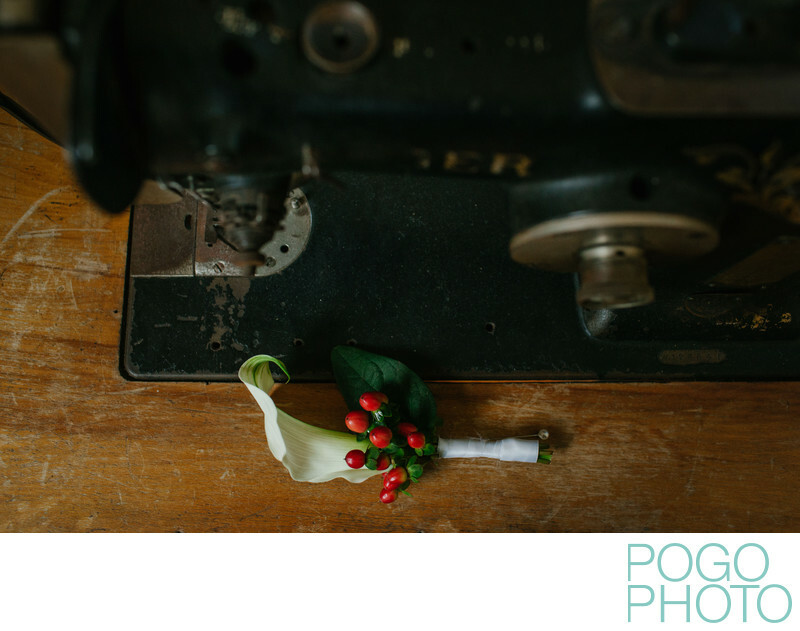 We took this detail photo of a white and red boutonniere next to an antique sewing machine during groom preparations at a rustic Vermont inn. We believe that photographing details during all parts of the wedding day helps fully convey the feel of the event, especially to people who did not attend it. Sometimes details are something obvious, like the bride’s jewelry, while other times they can be things like the grain of the wood in an aging farmhouse. We arrive early in the day to allow people to get fully comfortable with us and, more importantly, our cameras with their somewhat intimidatingly large lenses. While people are getting acquainted with us and learning to ignore the camera’s shutter, we have the opportunity to document certain details, like clothing before it is put on, or handwritten cards before they are delivered. Flowers can play a variety of roles during a wedding, setting tones reflecting couples’ personalities. From overtly ornate crafted masterpieces to simple wildflowers picked from a nearby field, the types of floral arrangements, bouquets, and boutonnieres we encounter vary greatly, each intriguing in their own way. We appreciate the impressive displays we frequently see in many of our South Florida nuptials, but we admit we were much simplistic when it came to flowers at our own wedding. A good friend is a former florist and happily crafted Em’s stunning bouquet six states away, then brought it with her on her drive to Vermont. For the flowers we used to decorate the reception, we wanted something that brought the feel of the Vermont wilderness inside while not clashing with the ambiance of the historic mansion that served as our venue. We tinted dozens of glass vases blue back in Florida, packed them for our drive to the Northeast, and then displayed them scattered across dining tables and ledges surrounding our dance floor. The flowers were picked at the house of a family friend who graciously offered us anything we would like from her backyard, which was basically just acres of wildflowers. Keeping with the rustic theme of this Vermont inn, we chose to incorporate some broken-in equipment and scuffed up wood to complement the delicate beauty and youth displayed in the boutonniere. Once they are pinned onto the lapel of a jacket, flowers become an accessory that helps signal the importance, if not formality of an event. They are also frequently and justifiably overshadowed by the person’s facial expressions located just a few inches away. In this detail photo, the delicate simplicity of the boutonniere takes center stage while its softness is enhanced by the contrast against the cold metal of the sewing machine. Rustic Vermont inns usually have quite a few surfaces like this one, allowing us to document the details in a variety of places and types of lighting. The character of historic places both in Vermont and throughout New England can come across in images like this while still being subtle and complimentary to the wedding day. Capturing the newness of the wedding and the seasoned personality of the venue in a single shot brings people into the image more easily than when they observe sequential photos trying to express two different things. Location: The Old Lantern Inn and Barn, 3260 Greenbush Rd, Charlotte, VT 05445. 1/200; f/4.0; ISO 1250; 35.0 mm.